You are an ardent gamer. You spend hours gaming. You get tremendous joy from gaming. You don’t even remember your personal chores, meals or anything else once you start playing games. And that is where you come into problem. Making you forget to pay attention to yourself and particularly to your health is one of the most serious drawbacks of gaming. And when it comes to health, posture and ergonomics are some of the most important points you should consider. Whether a hobbyist or a professional gamer, the tendency to sit in whatever awkward posture is common. It’s necessary for all gaming enthusiasts to understand the importance of posture and ergonomics. 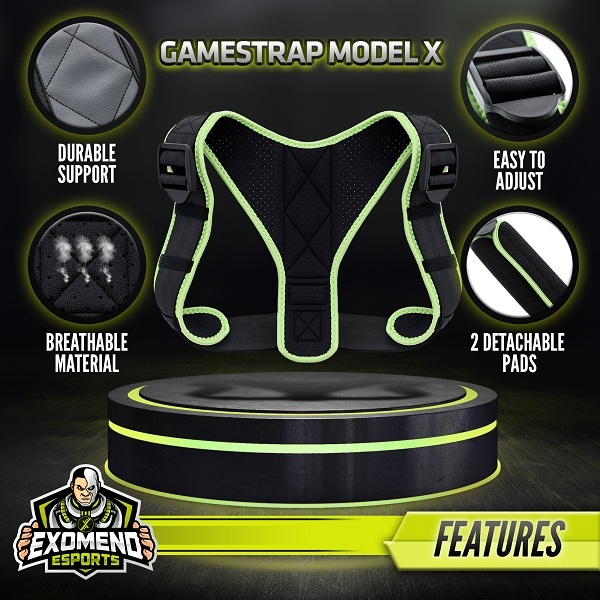 It’s important therefore to have a posture trainer for gamers like the ExoMend GameStrap. 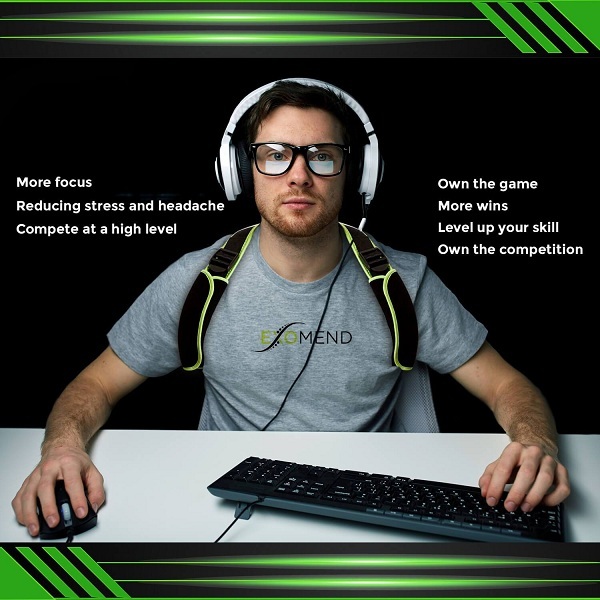 This wonderful device takes all the stress off your back so as to help you focus more on gaming. Don’t you think that if your shoulders and back start aching due to the weird posture you sit in while playing games, will you be able to enjoy games to the fullest? Half of your attention will be towards your aching back, arm or shoulder. 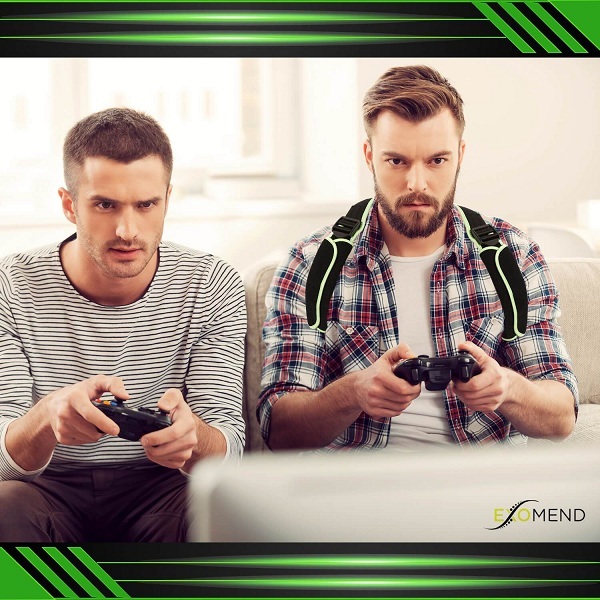 ExoMend has been designed with the very purpose to help gamers sit for a length of time without an ache or pain, and enjoy the game with a total focus. Lifestyle management is on top of this list because it includes posture and ergonomics and it’s the first step towards a healthy lifestyle for a gamer. Why Posture and Ergonomics are So Important? It’s important to understand that posture and ergonomics are closely related. In simple words, ergonomics forms an environment that helps one adopt the most ideal postures. These are the positions in which one’s body is applied with the minimum amount of stress and thus the muscles can work at the highest efficiency (as few efforts as possible to continue being in an upright position). And while your environment can decide how you are sitting as a gamer, it’s just as essential for you to actively adopt the proper posture to reduce the risk of stiffness, pain, injury and poor health in general. All in all, posture is an arrangement of your body parts in accordance with each other in the different positions as well as movements that you take or carry on during the day. 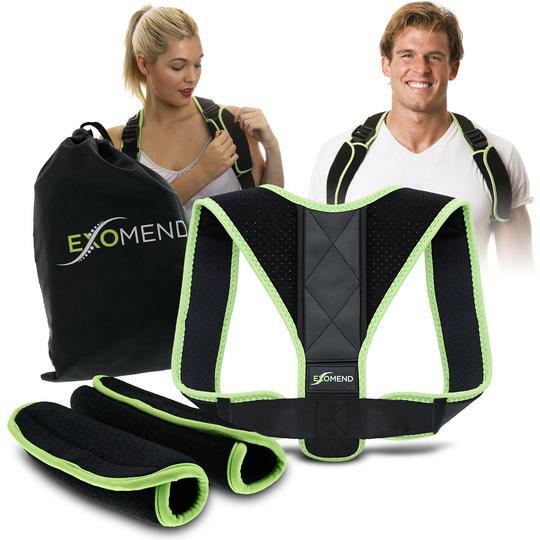 However, just talking about the right posture and how to adopt it is another thing, whereas actually consistently achieving it all through the different times of the day may be quite difficult and here’s where ExoMend comes to your rescue. But we are talking particularly about gamers whom ExoMend definitely helps. Ergonomics is a science of how well humans fit into different environments they work/play games in. it’s a study of changing your gaming environment to minimalize stress on your body and here are easy tips and methods to manage each constituent of your gaming setup. There are 3 important constituents within the gaming environment. When you sit upright, your horizontal eye level must meet a little above or at the upper 1/4th of the monitor. Also, the monitor must be a bit tilted back, if possible. This arrangement ensures that you will limit your neck’s movements to watch various things on your monitor, but more particularly, you won’t use your upper neck to look up. Your neck movement is directed by your eyes; so, by setting up your monitor a little below the horizontal eye level and tilted a bit backwards, you can minimize the requirement to use your neck to look up. If your monitor is too high, you usually tilt your neck slightly upward, while if it’s set too low, it can cause the dreadful forward head posture. It should be on 1-arm’s length away ± your hand’s length. However, it should also be remembered that everyone is different. There is the ability in our eyes to accommodate (altering the shape of the lens in the eye to see objects clearly at various distances) and converge (looking toward the nose to see objects that are closer). It has been found that convergence causes more eye strain; thus it means that farther is better in general. So, a distance where you hardly see details on the screen is not recommendable. But you should have the monitor set at a minimum distance. Thus the 1-arm rule was popularized because it’s a quick way to avoid overconvergence. 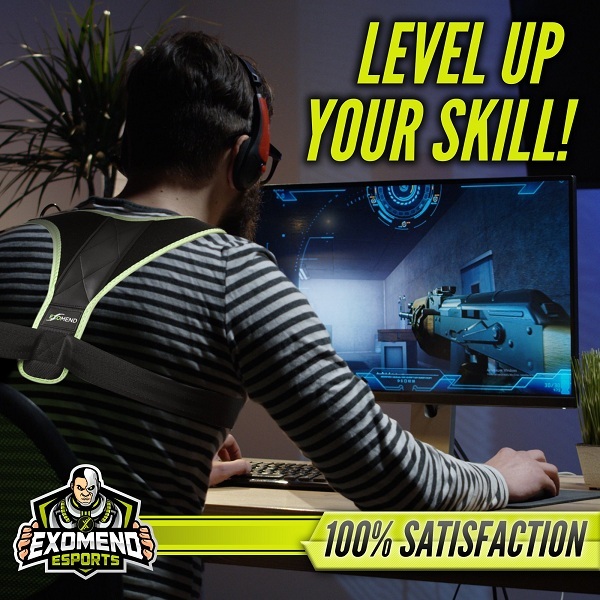 It states that the monitor should be placed at the length of your 1 arm extended in front of you while sitting in upright position, wearing ExoMend, the posture trainer for gamers. Since everyone’s eyes are different, you should adjust this further according to your own comfort. Thus the distance should be 1 arm’s length ± your hand’s length. From this distance, you are able to adjust your in-game, mac/Windows resolution. Peripherals are always talked upon a lot when it’s about ergonomics, as they are the main devices we use to play game. And as such, ergonomics for both keyboard and mouse is important but it ultimately comes down to preference and knowing the tradeoff. You should consider performance tradeoff while talking about ergonomics and ultimately, it’s the way you position yourself with the keyboard as well as mouse. It’s again important to understand that ergonomics is the position the device is placing in you. An ergonomic keyboard will place your wrist in a neutral position (a position wherein stress on joints and supporting tissues will be minimum). However, it’s known to have longer response times and less durability. Response time is important in gaming and thus the straight mechanical keyboard is the first preference, which usually places your wrist in extension (i.e. slightly bent upwards). Increased wrist extension causes higher risk of repetitive strain injury because of poor mechanical advantage. And this is how it positions us; but you can modify your own hand and wrist positions to continue the neutral positioning and thereby get the same effect an ergonomic keyboard offers. So, the performance tradeoff for an ergonomic keyboard is decreased risk of injury for longer response time. But as mentioned earlier, you can invalidate this tradeoff by understanding neutral positioning and trying to achieve it. The story of different mice is also the same. They cause different types of grip which can apply different amount of stress on your hands, wrists and arms. These are claw grip, palm grip and fingertip grip. All of them have their own benefits in terms of performance but have the tradeoff of increased risk of physical stress. Here too you can modify the position of your wrist to minimize this tradeoff. The positioning of your wrist and your behavior (how long you play) is more important than the kind of keyboard or mouse you prefer. Hence just choose one with which you are comfortable and take the time to learn proper posture. 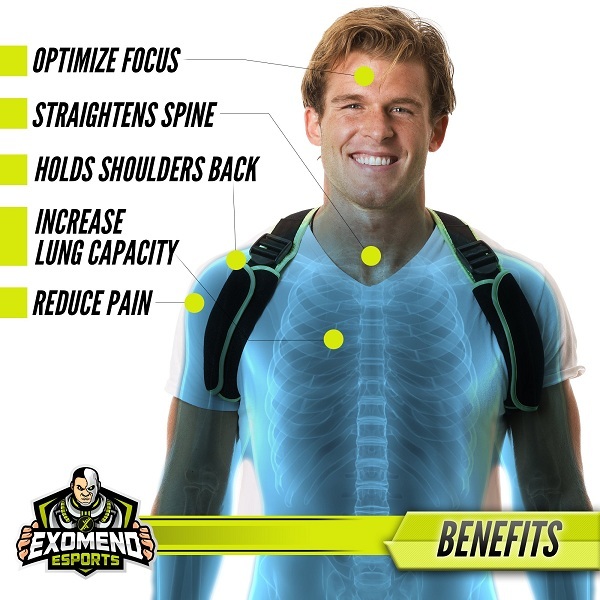 By wearing ExoMend, you can achieve proper posture, because it straightens your spine, holds your shoulders back and increases your lung capacity. This in turn minimizes pain and optimizes your focus. Choose a chair with backrest angle between 90 and 120 degrees which can support your lower back’s natural curvature. Begin at 90 and modify the reclining angle according to your comfort. It means that you should be able to determine your neutral spine position and then look for a back-rest or lumbar support that will properly conform to that. ExoMend, the posture trainer for gamers, can help you in this. Look for a height of the back-rest that will include a neck support, though it’s not required. Your chair’s height should be such that your hips and knees will roughly come to the same level and your feet will be supported flat on the floor (or a footrest). Setting your chair parallel to the ground lessens excessive pressure under the thighs that’s likely to stop blood flow. When their level is not the same, the position of pelvis and lower back is affected. If the hip is higher, the lower back turns too arched and if the knee is higher, the lower back turns too rounded. If feet are not supported, undue pressure can be exerted on the backside of the lower thighs, again stopping blood flow there. Foot rests are often required when tables are too high and are not adjustable. Your chair should have arm rests on which your elbows can be comfortably supported and your shoulders should be relaxed. They should not stop you from scooting forward to the desk’s front. Cushion is preferable because it can lessen pressure on your hip bones. 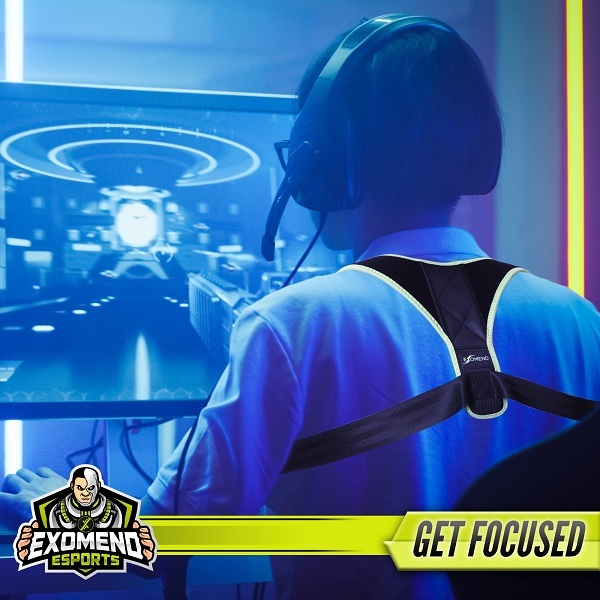 ExoMend GameStrap will help you practice good posture habits while you choose an ergonomic gaming setup. It will train your body to adopt proper posture and build muscle memory that will help you move better, play games better and minimize the risk of injury.